RevWrestling.com recently named Cary Kolat the best high school wrestler over the past 20 years. In high school, the Rices Landing, Pennsylvania native compiled an unblemished career record of 137-0, won four state titles, and placed twice at the prestigious Midlands Championships (third as a sophomore and fourth as a junior). Kolat was a four-time NCAA All-American and two-time NCAA champion while wrestling for Penn State and Lock Haven (1993-1997). He then went on to have great success in his post collegiate freestyle career. His freestyle resume includes World medals at the 1997 and 1998 World Championships -- silver and bronze respectively. He is said to be the best wrestler in U.S. wrestling history without a World or Olympic gold medal. Kolat was a member of the U.S. National Freestyle Team seven times and placed ninth at the 2000 Olympic Games in Sydney. He won gold medals at the World Cup (three times), Pan American Games, Goodwill Games, Cerro Pelado, Yasar Dogu, and Sunkist International. Cary Kolat was a member of the U.S. National Freestyle Team seven times. RevWrestling went one-on-one with Kolat to discuss his high school, college, and international careers, his wrestling club (Team Kolat), his camps, his mixed martial arts experience, and his future. Put yourself in our shoes, taking you out of the equation, who would you rank as the best high school wrestler over the past 20 years? Kolat: Geez, man, that's a difficult question. I read the article. It was really a well-written article. I liked all of the information about each wrestler. It's a very tough choice. I think when you get into the top-five guys, you start playing the tossup game, going back and forth. Even though this guy doesn't fall into the last 20 years, I would have to say the guy who inspired me to have success at such a young age was Jimmy Carr, who was on the 1972 Olympic Team. So, if you say, who do I pick? Well, I can't stay within the 20-year parameter, so I'm going to go right to Jimmy Carr. Amazingly, you placed third at the Midlands Championships as a sophomore in high school and fourth as a junior. The Midlands is considered to be one of the toughest collegiate tournaments in the country, especially back then. Talk about the experience of wrestling at the Midlands when you were in high school. What drove you to want to do that? Kolat: One of the guys I idolized when I was a kid growing up was Jimmy Carr. I got to know his brother, Nate, because he coached at West Virginia University, which was 20 minutes from my home. I got to know Nate and read some information about Jimmy. So I just tried to tackle his accolades and kind of follow in his footsteps and take the path he did to have success at a young age. One of the things he did was win the Midlands when he was in high school. So from about the age of 13 or 14, I started entering open tournaments and wrestling college guys. From there, Nate was able to make a call for me to the tournament director of the Midlands. That's what got me in. I felt a lot of pressure at first going in. I was kind of out there with the idea that I had nothing to lose. I really wanted to gauge where I was at -- how far I was off of Jimmy's target. You finished fourth at the 1992 Olympic Team Trials -- the summer after your senior of high school. What do you recall of that tournament and your performance out there? Kolat: It was disappointing. I felt like I could have easily started tackling the ladder and going up it. Looking back now, I wasn't mature enough to knock those guys off yet. I lost a match to Steve Knight with three seconds on the clock. He took me down right into a gut wrench and turned me with about three seconds on the clock. He began to start working his way up the ladder and I didn't get the opportunity. So it was disappointing. Wrestling fans across the country still talk about your epic match with Chris Bono at the 1992 Dapper Dan Classic during the spring of your senior year. The match ended in a 4-4 draw. What are your memories of that match? Kolat: I really have no memory of the match. I laugh because people always bring that up. It was a bad night for me. I didn't feel any pressure. A lot of folks felt like the pressure got to me being that it was the feature match and the last one of the night. I really don't know what happened. It was just a bad night for me and a great night for Chris. He deserved it. He wrestled tough that night. All I can do is look back and reflect on it. It was just one of those things that if I could change it would be great. But it's kind of how it wound up. Shortly after the Dapper Dan Classic, you entered the NHSCA Senior Nationals. Bono was in your weight class, but lost a match earlier in the tournament, which prevented you from wrestling him again. Were you disappointed that you didn't get a chance to wrestle Bono again? Kolat: Yeah, that was a big reason why I entered. I had no intentions of entering the tournament. I'm a competitor, so I wanted another crack at him. The tournament was the following weekend, so I jumped up a weight class and entered the event. He was beaten by somebody before that. Actually, Bono and I laugh to this day because there is a lot of controversy surrounding that match -- about the back points that were given. It's always a big joke between us. We're actually really good friends now. Have you watched that match against Bono since high school? Kolat: Never have. I've only seen bits and pieces. I've been on the Web site where you can see past events. I've actually never watched the match. But that's probably not uncommon for most wrestlers. I've watched matches that I lost before, but I usually try to stay away from them. Who is the one wrestler in U.S. history you would pay to watch wrestle and why? Kolat: Again, it would have to go back to Jimmy Carr. He was my inspiration for trying to wrestle in the events that I did at a young age. Here's a little insight to this guy. Craig Turnbull (the current head coach at West Virginia) was a sophomore at Clarion University when they were on top. He said, 'Cary, let's put it into perspective. Imagine an eighth-grader calling you up when you're a sophomore in college and saying, Hey, are you going to be home this summer? Because I want to make a World Team and I want to work out with you.' That's a great way to sum it up. Jimmy Carr was unbelievable and was an inspiration for me. Cary Kolat won silver and bronze medals at the World Championships -- and finished ninth at the 2000 Sydney Olympics. Your wrestling career has taken you all over the world. What is your most memorable wrestling experience or event? Kolat: The World Cups were always fun for me. You have the American flags waving. You have the Iranian flags waving. The fans go crazy. In Spokane, Washington, we had the Iranians in the finals for the team championship. We had a set back. Sammie Henson, our World champion from the previous year, went out and just had a bad match. In freestyle, you can easily get locked into a lace or a gut. And Sammie wound up getting teched. Tony Purler then went out and was beating the World champion from Iran, but wound up losing in the last few seconds. So that stung us pretty hard. We had two losses right off the bat and one was a tech, which hurt us team-wise. It just kind of fired me up. I came out and ended up beating my guy by a technical fall -- and the place just erupted. It kind of got the team back on track. Then McIlravy came out next. From there, we just kept opening up. So I'd have to say the World Cup was always my most enjoyable tournament because it was a team race. You always want to do well when you're representing the United States. You have had crucial matches overturned and have been on the wrong side of controversial decisions made by FILA (the international governing body for amateur wrestling). Have any of these negative experiences with FILA changed your love or passion for the sport? Kolat: No, those things haven't changed my love and passion for the sport. My father had a rule for me growing up that said you always have to be better than the referees. When you step on the mat, you assume that you're down by two or thee points -- and that's how you have to wrestle every bout. That was rule that I lived by my whole life -- and it just got me in the end. To this day, I always tell myself, if only I would have been just a little better. I have a youth club now here in Baltimore. I run camps. I have a club. I work with guys individually. So I take my experiences and what happened to me and say, 'This is why you always have to be better than the competition and better than the referees.' Referees are going to make bad calls unintentionally. And internationally, we've had calls that are intentional. You just have to wrestle through it. You wear a United States singlet. People in Europe and other countries have a certain opinion about us, so we just have to be better wrestlers all around. In 2002, FILA changed the weight classes. You had been wrestling at 63 kg, but the weight classes changed to 60 kg and 66 kg. It seemed like you were kind of caught in the middle. How did the weight class changes affect you? Kolat: I had the old, one foot in retirement, one foot out of retirement. After the Olympics, I was a little disappointed with what had happened. I had a little bit of anger in me, so I wanted to make another run. The weight below was just too far. The last time I saw that weight was when I wrestled 134 during my junior year of college. Then I bumped up to 142 when I was a senior -- but the freestyle weight was still 136.5. Anything between 136 and 142 was a great weight for me. When you start getting above that for me, it gets tough. I'm short. I just ended up giving up more and more leverage. If you actually look, you'll see guys who I competed with at 138 doing fine at 145. But a big part of that is the fact that they were like a head taller than me, so the jump to 145 wasn't such a big deal to them. That extra weight and extra strength just wound up getting up there too high for me. At the 1997 World Championships, you lost a controversial match to Abbas Hajd Kenari of Iran. He untied his shoe out of the view of the referee. And then once the referee was looking, he took a timeout to catch his breath and retie his shoes. Do you think that match caused FILA to reexamine their rules -- and the subsequent decision that you must have your laces taped or covered during competition? Kolat: It did. That's why we tape the laces now. That's one of the reasons for it. So, yeah, it had an effect. I mean, that's not necessarily why I lost the match. But it changed the momentum. I felt, had he not untied his shoes, I would have worn him down and come back. But for me, I always relate it to wrestling -- and the first mistake was made by me in the first 30 seconds of the bout. I gave up an early takedown right to a gut wrench. Kenari had an unbelievable low gut at the time. I was still young, maturity-wise. It was my first World Championships. If you look at World Cup Soccer, you'll see those guys go down and try to get those red and yellow cards -- and they'll do some acting. Internationally, that's just kind of how it is. You have to deal with it. What do you think about the recent changes that FILA implemented? Like the three individual match periods? Kolat: I actually talked to some guys about this. For me, I feel that the benefit was the one five-minute period. It was constant action. Conditioning played a factor -- as did technique. Right now, they're looking at judo and their rules. So, yes, technique is critical in wrestling. But I'm the kind of guy, I like to battle. I like to scrap. I like to get in the wrestling room sometimes when there is blood flying from a bloody nose, or somebody gets cut, or somebody gets hurt. I like to compete under those conditions. It's a lot more technique right now. Would I have enjoyed it? Yeah, I would have competed and enjoyed it. But I always preferred the one five-minute period. You are now a spokesman for Sharpie and Paper Mate's youth wrestling sponsorship program. Talk about your involvement the company and what exactly you do. Kolat: I am the national event marketing manager. The program is called Under Sponsored Sports. So we did a test model, wrestling, one of those sports with a large fan base. You have the NCAA Tournament that draws 90,000 fans over the course of three days. And you don't really see any large corporate sponsors involved in it. So we kind of had an initiative to start tackling some of these and testing them out -- and wrestling was our test model. Me being with the company at the time, it was a perfect fit. That's kind of how we got involved. We're sponsoring events all over the United States -- with Paper Mate leading the charge. It's my way to help give back to the sport that has given me so much. You run a successful youth wrestling club called Team Kolat. When did the club start? And what is your club's training schedule? Kolat: It really kicked off in April. We have different cycles. We have preseason folkstyle training. We have in-season folkstyle training. We have out of season folkstyle training. And then also freestyle and Greco-Roman in the summer. My wife is originally from Baltimore and I've got two children -- and my family is here, so it made it easier for us to move back to Baltimore. One of the others things is that I like challenges. My feeling is that Maryland has been a little behind when it comes to the caliber of wrestling that has been put out on the mat in states like Pennsylvania and New Jersey, which are right next door. There are a lot of kids who love the sport of wrestling. They just need the coaching. They just need somebody to get in there and design practices and put the hours in that it takes to boost Maryland wrestling. It was a great fit for my family -- and a challenge for me. I really enjoy coaching at the youth level, more than I enjoyed coaching at the college level. For me, I feel like it's a way to get my hands on kids early and fix those mistakes before they happen and really give a kid an advantage in a young wrestling career. You have been an assistant coach at numerous Division I collegiate programs. Do you have aspirations of taking over a Division I program? Kolat: You don't ever want to say no to anything. But I really like working with the kids. I like the flexibility, time-wise. There is more of a creation process, too. When you get a kid who has never wrestled and he signs up for your club, you get to start out and show him things. This is the way you should do your stance. This is how you should move. This is how you should attack. This is the defense you should use. You really get to put a product out there that is you. And then you try to give that kid the best experience he can have with the sport. It's nice to see them enjoy winning -- and it's nice to be a part of that. And then you send them off to college and hope they continue to have that success. And then when they look back, they think of you as the guy who mentored them and got them in the right direction. I really like where I'm at. If it presented itself to me, a college coaching position, I would give it a thought. I would definitely think about it. But I really like what I'm doing now. Do you still follow collegiate wrestling pretty closely? Kolat: Yeah, but I really have to catch up on these high school athletes. I stay on top of it as much as possible. I'm checking to see who's doing well and who's not from guys I've known since they were kids or in high school. You run a very successful series of wrestling camps. Talk about your different camps and how people can get more information or register for them. Kolat: You can go to my Web site, carykolat.com. We'll also have brochures that will go out throughout the United States. I offer a variety of camps. I have Kolat Youth Camps for guys who are just getting started in the sport. We have Kolat Competitor Camps, which is an intermediate technique camp that focuses on technique, proper drilling, and proper training habits. And then we have a third level called Kolat World, which is for advanced techniques. That's where you expect to see your throws and your inside trips. It moves at a high pace. These are for guys who have been wrestling for years. They don't want to go to camp and see the typical stance, motion kind of stuff. Again, there we emphasize combination drilling, teaching yourself how to scramble. I also offer something called Kolat Specialty Camps. These are focus camps. It's four days of either takedowns, top, or bottom. You get to put emphasis on an area where you need more work. A lot of guys have trouble getting off the bottom, so they can sign up for the bottom camp and it's four straight days of learning how to gain hand control, free your hips, and get off the mat. And we also offer our Kolat Intensive Camps. Those run in packages of 5, 10, and 15 days. I try to put those during the season for guys getting ready for Junior Nationals, Cadets, that kind of stuff. 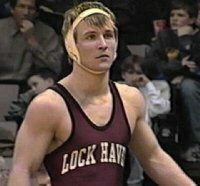 Cary Kolat won two NCAA titles for Lock Haven (1996 and 1997). OK, looking back on your career, who is the best wrestler you competed against during your college days at Penn State and Lock Haven? Kolat: Yeah, you know what, Mark would be. I always felt that I wasn't ready for that match. I had been sitting out. But I've watched Mark over the years. I have a lot of respect for him. He was tough. I've been tired in bouts before. I always wanted to get a rematch on that and set the record straight. No, Mark is a great guy. There's no doubt, he pushed me to the wall that day. So I'd have to say that Mark Ironside was the toughest competitor in college. Who was the best wrestler you ever wrestled in freestyle here in the United States? Kolat: Let me think … hmmm … I'll tell you who it was, and it wasn't in competition. At the 2000 Olympics, I was going to take Sanshiro Abe as my training partner. While we were at the U.S. Olympic Training Center, he got injured. John Smith walked this guy over and said, 'Hey, this guy will drill with you if you want. His name is Jamill Kelly.' Man, I put my hands on that guy and I was like, 'This kid has all the tools to be a really great wrestler.' So Jamill came to my house in Morgantown, West Virginia and stayed with us for two weeks. He helped me prepare for the Olympics. He trained with me. I took him over to Sydney. He went over there as my training partner. I always said that he was going to be really good. At the time, Jamill was just mentally having some trouble busting into the U.S. Open scene in the United States. When I retired, he just turned it on. So we never competed in a tournament, but we competed in the practice room, and that kid was tough. I always knew that he would do well. So you weren't too surprised by Jamill Kelly's success at the 2004 Olympic Games in Athens, where he brought home a silver medal? Kolat: Not at all. Not one bit. Another story … When McIlravy came out of retirement, he called me up. This was after they had changed the weight classes, so some of the guys had bumped up from my weight class. McIlravy said, 'Can you just give me a little insight on some of these guys?' I told Lincoln, 'The guy you want to watch out for is Jamill. The guy is underestimated. I've trained with him. He's strong. He's technical. And he has explosive hips. If he puts it together, he can wrestle.' That was always my call. The guy is tough. Who is the best wrestler you have ever wrestled outside of the United States? Kolat: Kenari. He had great position. He really tried to slow you down when you wrestled him. He was tough with his turns. He had great hips and an unbelievable gut wrench. I wrestled him in the finals of the World Championships in 1997 and then again at the World Cup at Oklahoma State University in 1998. He was tough. I always felt like he was the toughest guy. In September, you competed in a mixed martial arts event while fighting for Team Quest. Do you plan on still training and continuing your MMA career? Kolat: I don't know. I'm always on the mats and stuff. I don't really have any desire to step on the wrestling mat anymore. I was rolling around with a couple of guys who did it, so I decided to jump in and try a fight. I enjoyed it. I had fun. It was exciting for me. It's my kind of style. But with my job duties and with my club and things of that nature, for me, that's first and foremost. I dedicated so much of my life to wrestling and put family engagements on hold. I have two girls. So when it comes to training, if I have a choice to go see my daughter at a school play, or go practice, I'll go see my daughter. I'm not training the way that I should to be a competitive athlete. So … I'm not sure. I'm still kind of up in the air with that. So a wrestling comeback is out of the question? A lot of wrestling fans, including me, would love to see you get back on the mat and make a run at the 2008 Olympic Games. Kolat: Yeah, that's out of the question. It's nice to know that people still think about you and what you did in your career. You get old, you know, so you want to reflect on some of those memories. No wrestling comeback for me. But I'm on the mats every day wrestling with my guys.